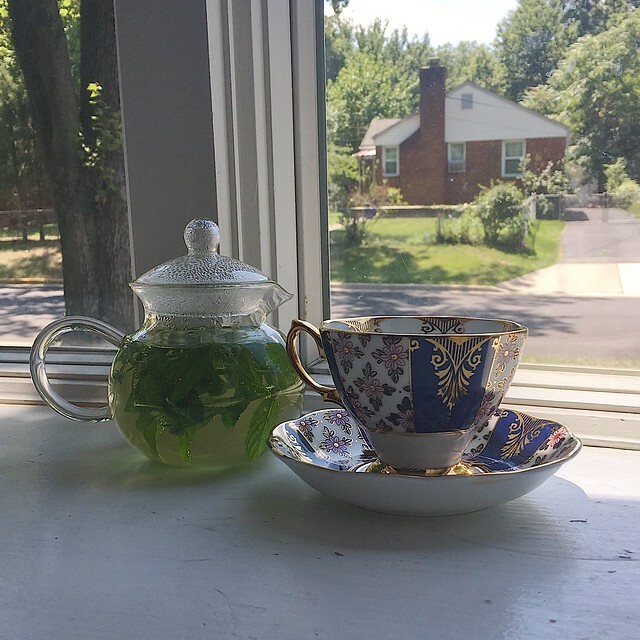 Every so often, I will share my weekend cups of tea on Instagram and one thing may have become a bit apparent: I’m trying to drink less caffeine on the weekends, particularly in the afternoon. So I’ve started creating some lovely non-tea herbal and fruit infusion on the weekends. One of my favorite herbs for an iced tea is red raspberry leaf. Long lauded as a remedy for all manner of “women’s trouble,” I like it for it’s dark, tannic bite that is reminiscent of black tea, without the caffeine. Mixed with a sweeter herb, like peppermint, and served over ice with a touch of local honey, this makes a lovely afternoon infusion. I’ve also found a fondness for flower-based infusions. Red clovers have a grassy flavor and impart a pink color to an infusion. Mixed with lavender, the herbal-floral quality of the lavender mixes with the clover and makes a delightful infusion, particularly with a bit of honey and lemon. Finally, sometimes I take my afternoon infusion hot. One of my favorite simple cups is an infusion of fresh mint leaves from my garden, steeped for a five to ten minutes, and served simply in a tea cup, with no additions. The brightness of the mint and the warmth of the water are perfectly comforting and invigorating, without being overly stimulating. Of course, all of these are best enjoyed outdoors, if the weather permits, or else curled up next to a sunny window with a good book.